The Pitch: Number 22… is alive! Your move, creeps. The Review: The cinema of my childhood was defined by two very different film watching experiences. That’s if you can call it cinema, as the demise of picture palaces in my home town saw me watch most of my films on the technological wonder that was VHS. Some of that was made up of the typical family fare that was a staple of popular cinema in the Eighties, from The Karate Kid to Flight Of The Navigator and The Goonies to Short Circuit. As the decade drew to a close I was allowed by my very liberal mother to take in some of the action greats of the decade before I’d reached the 18 rating recommended, such as Aliens and Die Hard, Lethal Weapon and Robocop. I suspect, although he’s half a decade younger than me and from the other end of the world, that Neill Blomkamp may have had a similarly formative childhood, given that his latest film appears to be an attempt to splice together those two genres by combining the family friendly robot education of Short Circuit with the corporate satire and blood-letting of Robocop. Normally I’d suggest it’s fairly reductive and not particularly helpful to boil a film down to such obvious constituent components, but Blomkamp seems to be going out of his way to remind us of the heritage of his film. While it’s thrust into the same milieu as his breakout film District 9 with the South African slums providing a stark backdrop, there’s more than a little feeling of Old Detroit about the wasteland hideout of the gangsters who take in Chappie and try to give him an unsuitable education. Even the ED-209 style robots that form the bulkier competition in the security robot industry have the voice of old Tinhead himself, Peter Weller. On the flipslide, Chappie (Sharlton Copley) is a South African accent and a set of wheels away from being Johnny Five and while the film’s conceit of what would happen if you dropped a learning robot into the wrong environment feels original, the patchwork from which it’s been composed verges on over-familiar. But you want original? How about making two of your lead characters a South African rap duo Die Antwoord who are friends and fans of the director with no real acting experience? As security droid Chappie falls under the influence of Yolandi and Ninja, he’s torn by the basic morality given to him by his creator (Dev Patel, yet another example of a single genius creating artificial intelligence in film making you wonder why we even bother to have corporations, but I digress). At the same time, the audience is torn by wondering if casting two non-actors as the two main human leads in your film is brave or foolish, and it’s probably a bit of both. Ninja and fellow cohort Yankie (actual actor Jose Pablo Cantillo) feel like stock villains, but Yolandi adds some maternal instinct and warmth and the gangster trio are certainly quirky for this kind of film, if not always particularly appealing. Adding to that off-kilter feeling is the fact that Die Antwood’s music is playing regularly in the background – although complemented well by the hard work that Hans Zimmer’s score does to integrate it – and what you’re left with is a whole bunch of oddness to offset the familiarity. I wouldn’t say that there was much else original about Chappie – the other prominent humans (Hugh Jackman and Sigourney Weaver) are stock characters and for a long stretch, the story doesn’t progress in any surprising directions. There’s a weak grasp of science, some of the dialogue – especially most of what Weaver is lumbered with for exposition and pretty much anything Patel says – is corny and unbelievable and Blomkamp applies many of District 9’s worst flaws, such as reality TV overlays that he promptly forgets about, without being able to capture its most redeeming features. The film makes a genuine attempt to combine the sweetness and naivety of Short Circuit with the satirical violence and grunge of Robocop, and not for one minute does it ever look like working. It’s only in the last half hour or so when the warmth begins to shine through that Chappie feels like a worthwhile exercise, and even then there’s as much to be at best bemused by as there is to love. Chappie is eccentric, oddly sweet and unlike the work of any other big-budget film maker you’ll see today, and for that we should be grateful, but District 9 is feeling more and more a one-off than the start of a solid career and Blomkamp will have to do more to convince that he’s not headed for a career residing at the bottom of the bargain DVD bin at your local supermarket. What about the rating? Rated 15 for strong language and bloody violence. There is one stand out moment of violence at the end which feels almost incongruous against some of what’s come before, although it would have felt right at home in Paul Verhoeven’s original Robocop. I’d buy that for a dollar. My cinema experience: Saw this at on a weekday evening at The Light cinema in Cambridge. The joys of the film playing on a large screen at The Light are that I get a seat in the middle of a row with enough legroom to sit comfortably: if you change anything as part of your takeover of the cinema, The Light owners, please keep that legroom, it’s invaluable for lanky so-and-sos such as myself. About two thirds of the way into the film, I became distracted when someone in the row in front had seemingly become bored of the film and took his phone out to check Facebook. In my book if you’re that unengaged by what you’re watching there’s just one think you need to do: leave. On politely asking the gentleman if he would turn off his phone, I got sworn at for my trouble. I’m sorry, whoever you are, that you felt personally affronted by me asking you to turn off a four inch square torch that you were shining in the middle of a darkened room which immediately took me out of my own viewing experience, but if you believe it’s OK to sit and check your social media during a film then can I politely ask you don’t watch the same films as me in future? 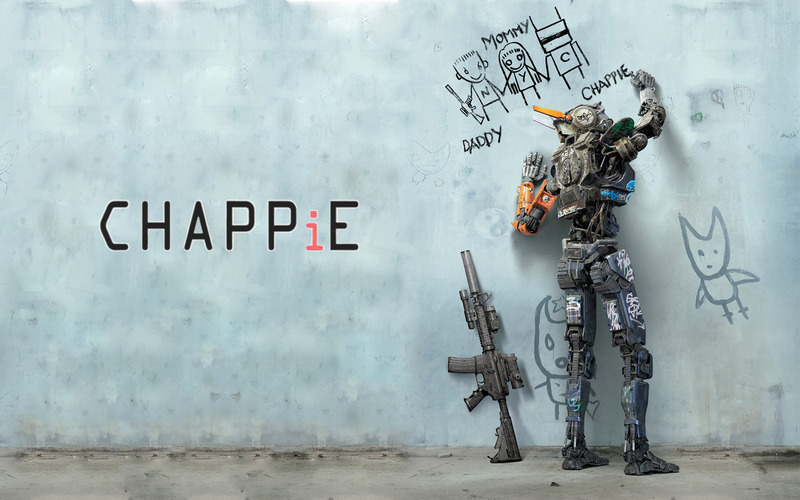 This entry was posted in Reviews and tagged 2015, Chappie, Dev Patel, Die Antwoord, film, Hugh Jackman, movies, Neill Blomkamp, review.